Our systems have been installed in a wide variety of industries, and for use in a wide variety of applications. Any industry that uses water in their production process is a potential client of ours. Mop water, floor scrubber water, tank wash, equipment wash, ultra-filtration and Reverse Osmosis (RO) concentrates, compressor blow down, die marking link, ground water remediation. Industrial wastewater treatment is any process that separates and removes contaminants from industrial process waters (effluent). These contaminants include oils, dissolved heavy metals, suspended solids and organic compounds. Either the local municipality, or the Federal Government regulates the specific contaminants. A series of limits are set to determine the suitability for discharge. These limits must be met for the water to be legally discharged. If these limits are not met, the water must be pre-treated before being discharged, to remove the majority of the regulated contaminants. Although we are technically providing pre-treatment systems, we refer to them as treatment systems. What makes Wastewater Engineers, Inc. different from other companies is that we have a total commitment to the industry. We specialize in this area, and can provide common sense advice derived from years of experience. We provide a written guarantee of our systems’ performance. We bring fluid management expertise to our clientele, providing added benefits and cost savings. We provide complete, turn-key systems, which handle the water from source to discharge. We provide excellent service after the sale, and back our systems with warranties up to 3 years. We have adopted a three-phase approach to treating industrial wastewater. The three phases are Pre-treatment, Chemical Treatment, and Post-treatment. While our unique treatment will remove up to 3% total oil, those effluent streams that exceed this total must have a means to remove excess amounts. Free Oil is removed by our belt oil skimmers and wheel skimmers or via our innovative ‘W-Pak’ honeycomb designed oil coalescers. Emulsified Oil is often removed via our unique, one-step flocculation products – without emulsion-splitting chemistries. However, many emulsions are tightly bound by high quality emulsifiers and require an ’emulsion breaker’. Our unique, non-acidic WE-KAO-L is a safe, low cost additive that will break the oil emulsion. Often it is necessary to remove gross solids from a waste stream prior to chemical treatment. Filtration and settlement are two favored methods of removing or reducing gross quantities of solids. We accomplish the removal process automatically via our own settling tanks, gravity bed filters, canister bag filters, proprietary settling techniques, etc. 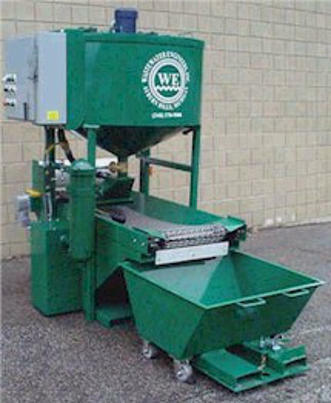 Physical separation techniques for the removal of oil and solids by themselves may sometimes provide recycling & reuse fluid quality, but not prepare the candidate effluent for discharge to sewer. Therefore, the requirement to assure cleanliness of the fluid for either reuse or disposal should be tested. Further treatment may require removal of dissolved metals, suspended solids, oil and a variety of other contaminants. Our range of blended flocculants (known as KM-Reactants) will typically remove dissolved metals, suspended solids and oil – without commonly used pH adjustment. In fact, our proprietary treatment will not only remove these contaminants, the resultant, high quality of floc will actually pass TCLP and can be disposed to land fill as non-hazardous. This non-leaching, non-hazardous result is accomplished via an encapsulation process that occurs within a single mix vessel when using the KM Reactants. In short, the Reactants not only precipitate metals and capture the metals, oil and solids, the resultant floc by-product is guaranteed, in writing to pass TCLP. Please contact Wastewater Engineers, Inc. via the enclosed form for a technical paper that describes this unique capability. Post treatments can be either “polishing” of cleaned water, or pH adjustments. Some “ols”, that is; alcohols and glycols and such, have to pass through charcoal or other final capturing methods to finally strip out the impurities. Ammonia traces can be effectively removed with a zeolite column. Interestingly, we can adjust our chemical treatment to leave in soaps, detergents, inhibitors, and other expensive replenishments, giving you more savings. If bacterial contaminants are an issue, we supply either a chemical oxygenator or effectively remove the colony by passing the clean water through Ultra-Violet purifiers. Many options are available to us, individually or in combination.